Born in Martinique, a writer and professor of Classics graduate of the Sorbonne, Suzanne Dracius published in 1989 her first novel, L’autre qui danse, finalist for the Prix du Premier Roman (Seghers ; Editions du Rocher 2007. English translation by Nancy Carlson, Seagull, London, 2015). Her stories, which feature strong, rebellious women characters, have been published in her collection of stories, Rue Monte au Ciel, Coup de coeur FNAC (Desnel, 2003 ; English translation by James Davis Climb to the Sky, UVA Press, USA, 2012). In 2005, Dracius published a play, Lumina Sophie dite Surprise who won the Médaille d’Honneur de Schoelcher. In 2008, Dracius published Exquise déréliction métisse, collection of poems who won the Prix Fetkann (English translation by Nancy Carlson, Tupelo Press, USA, 2015 and Spanish translation by Verónica Martínez Lira, Espejo de Viento, Mexico, 2013). In 2010, Dracius won a Prix de la Société des Poètes Français (Prize of the Society of the French Poets) for its whole work. In 2014, she published Déictique féminitude insulaire, poems. In 1995, Dracius stayed in the USA as a Visiting Professor, lecturing about her own books at the University of Georgia, and in 2006, at Ohio University. In 2009, Dracius is invited to a writer’s residency at Cove Park (Scotland). Dracius is FFRI (France-Florida Research Institute) Visiting Professor in February 2012. Suzanne Dracius, author and playwright, was born in Fort-de-France and grew up in Sceaux, a suburb of Paris, where she spent her adolescence. She later returned to Martinique, where she now resides. A writer and former professor of Classics graduate of the Sorbonne, both in France and also at the Université Antilles-Guyane, Suzanne Dracius is the author of novels, short stories, poetry and plays. In 1989, she published her first novel, L’autre qui danse, finalist for the Prix du Premier Roman (Seghers ; Editions du Rocher 2007). Dracius’s two short stories have been anthologized in American classroom collections of literature in French from beyond l’Hexagone (Diversité, publisher : Houghton-Mifflin, Boston). Her stories, which feature strong, rebellious women characters, have been published in her collection of stories, Rue Monte au Ciel, Coup de coeur FNAC (Desnel Press, Fort-de-France, Martinique, 2003 ; English translation by James Davis Climb to the Sky, UVA Press, USA, 2012). In 2005, Dracius published a play, Lumina Sophie dite Surprise (Desnel), who won the Médaille d’Honneur de Schoelcher. In 2008, Dracius published her first collection of poems, Exquise déréliction métisse (Desnel), who won the Prix Fetkann. In 1995, Dracius stayed in the USA as a Visiting Professor, lecturing about her own books during one semester at the University of Georgia, and in 2006, at Ohio University during the Spring Quarter. In 2009, Dracius is invited to a writer’s residency at Cove Park (Scotland) from 22 June to 1 August. In 2010, Dracius won a Prix de la Société des Poètes Français (Prize of the Society of the French Poets) for its whole work. Dracius is FFRI (France-Florida Research Institute, University of Florida) Visiting Professor in February 2012. Suzanne Dracius, author and playwright, was born in Fort-de-France and grew up in Sceaux, a suburb of Paris, where she spent her adolescence. She later returned to Martinique, where she now resides. A writer and former professor of Classics graduate of the Sorbonne, both in France and also at the Université Antilles-Guyane, Suzanne Dracius is the author of novels, short stories, poetry and plays. du Premier Roman (Seghers ; Editions du Rocher 2007), about a young female protagonist who, like the author’s younger self, is an Antillean transplanted to France. However, unlike Dracius, who appears completely at ease in her trans-Atlantic identity, her protagonist descends into tragedy as she leaves France to search for a true spiritual and societal home. In the intervening years, Dracius has written two short stories that have been anthologized in American classroom collections of literature in French from beyond l’Hexagone , “La Montagne de Feu” and “La Virago”(Diversité, publisher : Houghton-Mifflin, Boston). Her stories, which feature strong, rebellious women characters, have been published in her expanded collection of stories, Rue Monte au Ciel, Coup de coeur FNAC (Desnel Press, Fort-de-France, Martinique, 2003 ; English translation by James Davis Climb to the Sky, UVA Press, USA, 2012). With this collection, Dracius strikes out on her own with a new energy and a bold attitude : a kind of feminist version of her male compatriots’ créolité. In 2008, Dracius published her first collection of poems, Exquise déréliction métisse (Desnel), who won the Prix Fetkann. Overall, Dracius’s work emphasizes Martinique’s complex cultural history, and its shaping by Asian, European, as well as African cultures. In 1995, Dracius stayed in the USA as a Visiting Professor, lecturing about her own books during one semester at the University of Georgia, and in 2006, at Ohio University during the Spring Quarter. "Suzanne Dracius is a prize-winning writer from Martinique whom the French Cultural Minister has called ‘one of the great figures of Antillean letters.’ She writes in French and peppers her work with Creole, drawing on themes of ‘métissage’ (refers to the blending of two distinct elements, in either a biological or cultural sense) and ‘marronnage’ (refers to the flight of slaves from their masters). In addition to Creole, Dracius makes generous use of Latin and Greek, as well as rare French words and verlan (French slang which reverses the order of syllables in several common words). 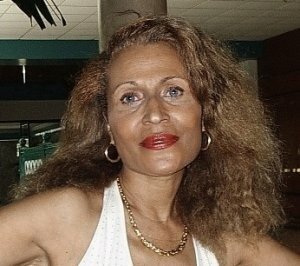 Dracius often references the finely calibrated racial distinctions on the black/white continuum found in Martinique, including calazaza women like herself, known for being light-skinned, multi-racial, and having red or blond hair. While traveling to Martinique last year, thanks to a grant from the Arts & Humanities Council of Montgomery County, I had the pleasure of meeting Dracius. Although we had exchanged countless emails while collaborating on the translations, I found it invaluable to work with her in person, as well as to see with my own eyes the landscapes described in the poems. She was a gracious hostess who showed me around the island, including the deadly volcano that overshadows the town of Saint-Pierre, as well as the stunning Caribbean beaches at sunset. She even introduced me to the president of Martinique, Serge Letchimy. " H. Adlai Murdoch, Tufts University. I am delighted to accept your translation of Suzanne Dracius’ poem “Antonomasia in Cyclone Times”/“Antonomase en Temps de Cyclone.” With its intellectual force and lyrical density, it is the perfect poem for the Notre Dame Review. Suzanne Dracius is undoubtedly one of the main voices of contemporary Franco-Antillean littérature. Dialogues francophonesnumber 16, « Les francophonies au féminin », Editura Eurostampa, Université de l’Ouest, Timişoara, Roumanie, 2010. Suzanne Dracius is an acclaimed writer of numerous novels and articles ; she is also a distinguished professor and an active participant in cultural affairs in Martinique. « La Virago », in Diversité : la nouvelle francophone, Houghton-Mifflin, Boston, USA, 1995. « Montagne de feu », in Diversité 2nd Edition : la nouvelle francophone, Houghton-Mifflin, Boston, USA, 2000. The Post (USA) 5 mai 2006. EGEA-KUEHNE, Denise (Louisiana State University, USA), « The Idiom of the Other : Three Francophone Writers of “The Fringe”, Ahmadou Kourouma (Abidjan, Ivory Coast), Suzanne Dracius (Martinique), and Barry Jean Ancelet (Louisiana, United States) », The European Legacy, Publisher : Routledge, part of the Taylor & Francis Group, Volume 11, Number 7 / December 2006. Pages 775 - 784. FERLY, Odile (Clark University, USA), article "Dracius, Suzanne" in Encyclopedia of the African Diaspora : Origins, Experiences, and Culture, Volume 3, p. 398-399 - Editor : Carole Elizabeth Boyce Davies - ABC-CLIO, 2008. FERLY, Odile (Clark University, USA), « The Fanonian Theory of Violence in Women’s Fiction from the Caribbean », in Convergences and Interferences : Newness in Intercultural Practices, ed. by Kathleen Gyssels and Isabelle Hoving, Amsterdam : Rodopi, 2001, pp. 107-119. GALLAGHER, Mary (Oxford University, Grande-Bretagne), Soundings in French Caribbean Writing since 1950. The Shock of Space and Time pp. 213-214, Oxford University Press, 2002. "The métisse sage in Rue Monte au ciel", in Métissages et marronnages dans l’oeuvre de Suzanne Dracius, directed by Yolande A. Helm, L’Harmattan, Paris, 2009, p. 93. HILL, Edwin (University of Southern California, USA), "Monnaie mythique : a woman’s worth in Suzanne Dracius’s Rue Monte au ciel", in Métissages et marronnages dans l’oeuvre de Suzanne Dracius, directed by Yolande A. Helm, L’Harmattan, Paris, 2009,	p. 161. LIONNET, Françoise, Postcolonial Representations : Women, Literature, Identity. « Inscriptions of Exile : The Body’s Knowledge and the Mythe of Authenticity in Myriam Warner-Vieyra and Suzanne Dracius-Pinalie ». Ithaca : Cornell University Press, 1995 : p. 87-100. MURDOCH, H. Adlai, Creole Identity in the French Caribbean Novel : « L’Autre qui danse : The Modalities and Multiplicities of Métissage ». Gainesville : University Press of Florida, 2001 : p. 142-196.